The Wagner Museum. Photograph by Rob Cardillo. 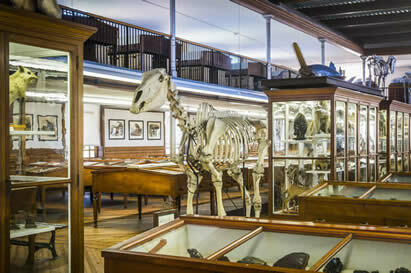 As you walk through the museum at the Wagner Free Institute of Science, you’ll encounter a Saber-toothed cat from the Ice Age and a Draft-horse from the Victorian age. You’ll see the science of evolution, the evolution of science, and the history of ideas. On Friday April 26 at 4 pm, the Wagner will offer a new, after-hours guided tour through our 19th century exhibit hall that explores the history of the theory of evolution, a theory that has shaped both science and society. We’ll consider scientific research on extinction, natural selection, and prehistoric man, and we’ll also examine the broader ways evolution sparked and continues to spark hopes and fears about change—biological change, social change, and individual change. We’ll share the stories of our specimens and place them in the vast historical contexts to which they belong. We will also invite personal reflections on how evolution—from dinosaur bones to high school textbooks to 23 and Me—is part of your story too. Date: Friday April 26th, 4-6pm. Doors will open at 4 pm. The tour will begin at 4:15 pm.